Thank you Crate & Barrel for sponsoring this post. While this was a sponsored opportunity from Crate & Barrel, all content and opinions expressed here are my own. 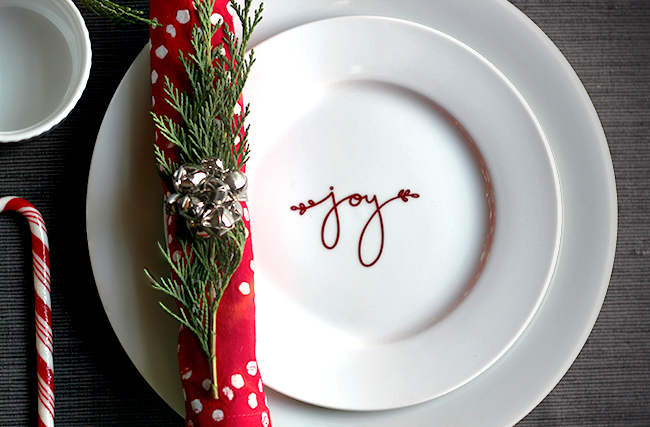 I've talked many times before about how much I love entertaining this time of year. One of my favorite ways to celebrate the season is to have a few friends or family members over for a meal, holiday music, and quality hang out time. And although I prefer to keep things mellow in terms of food and formality, creating an atmosphere that invokes the spirit of the holidays is important to me, especially at the table. 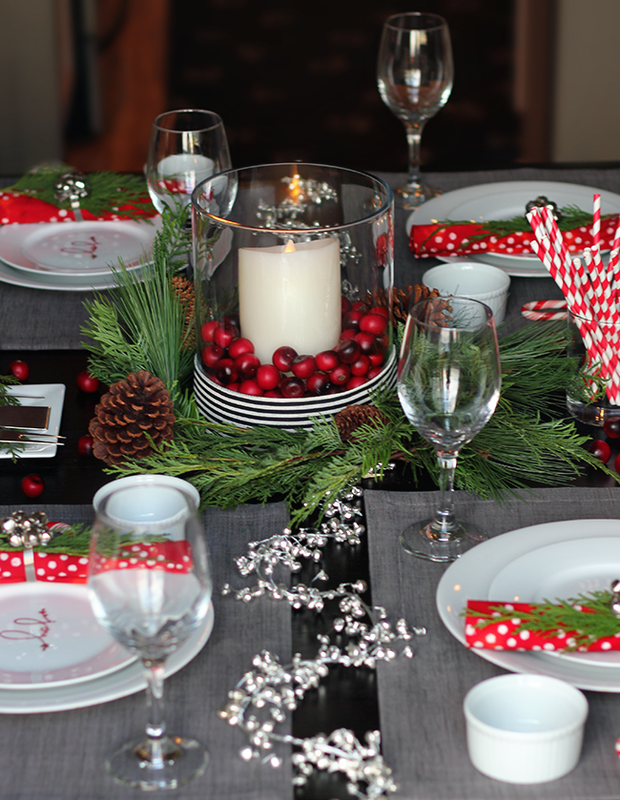 We recently had a few friends over for a casual dinner, and I decided to design a fun seasonal tablescape using some of my favorite pieces from Crate and Barrel. 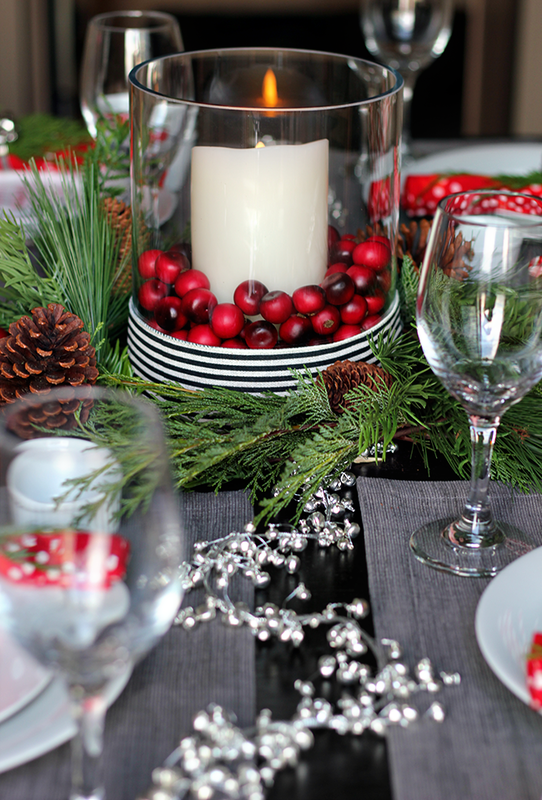 I wanted to focus on crisp white paired with pops of vibrant red and festive silver, mixed with fresh seasonal greens. I'm a big fan of bold (but clean) modern design combined with rustic touches, so this felt like the perfect combination for a relaxed holiday gathering. 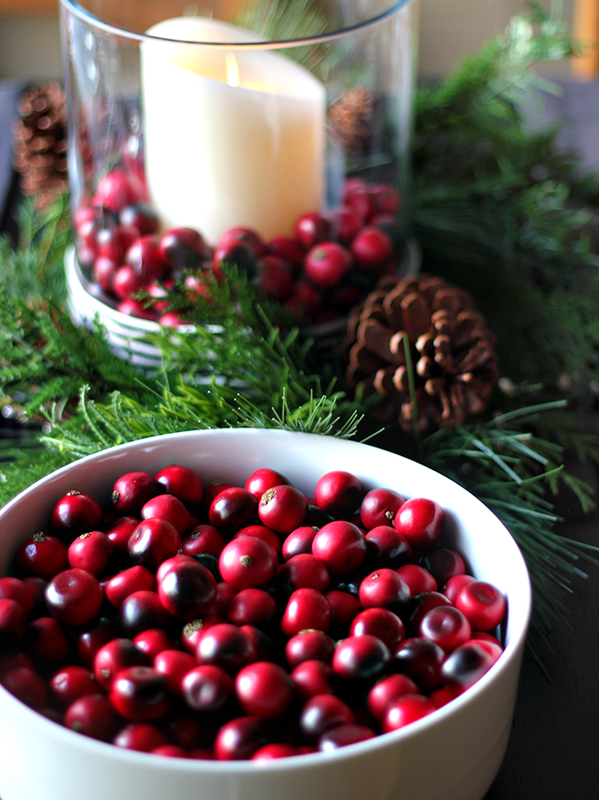 For the centerpiece, I wanted to create some simple ambience that felt both cheery and cozy. I decided to use a flameless candle inside of this beautiful handmade glass Taylor Hurricane, filled with faux cranberries, and finished with a piece of wide black and white ribbon around it. 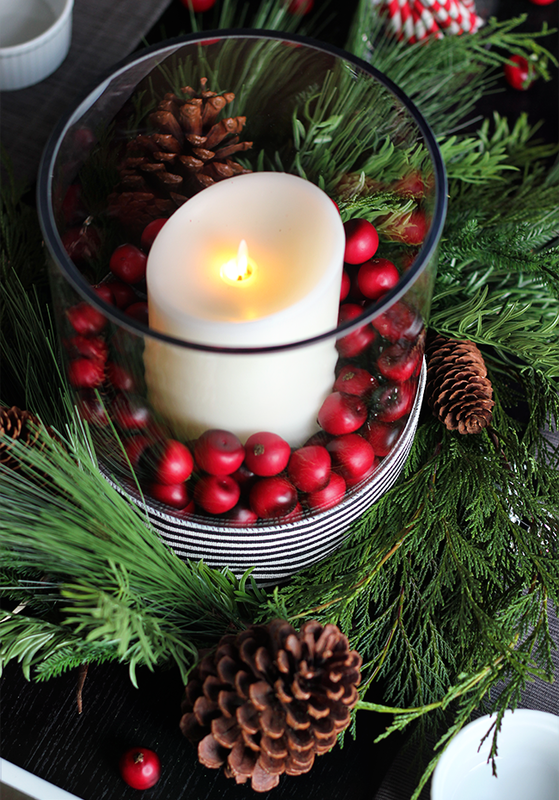 A few sprigs of fresh greens and pinecones placed around the hurricane added a nice rustic touch to the centerpiece and made it feel more seasonal. 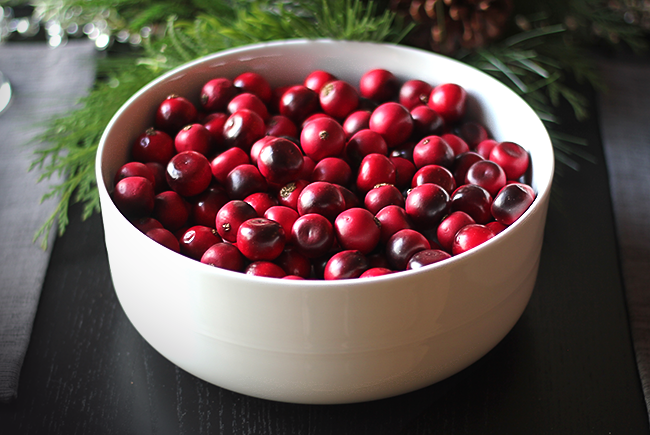 I ended up being so smitten with the cranberries (they look incredibly real) that I also sprinkled a few of them on bare spots on the table, and used them to fill my beloved Hue White Serving Bowl, which is basically the most attractive serving bowl of all time. (Trust me on this.) 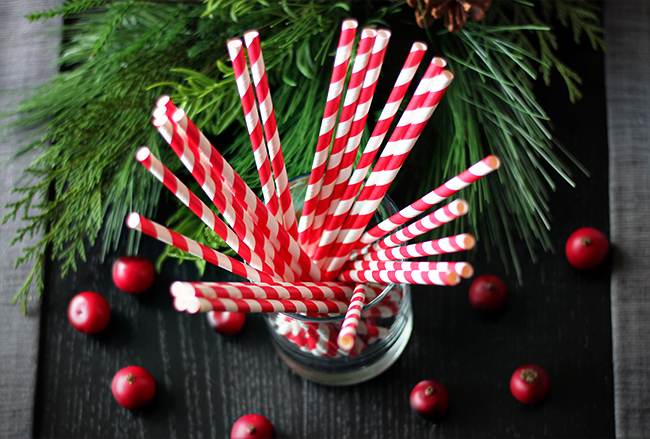 My regular readers know that I'm a huge fan of stripes, so I also added a candy cane to each place setting, and set out some Red and White Straws for guests' water glasses. 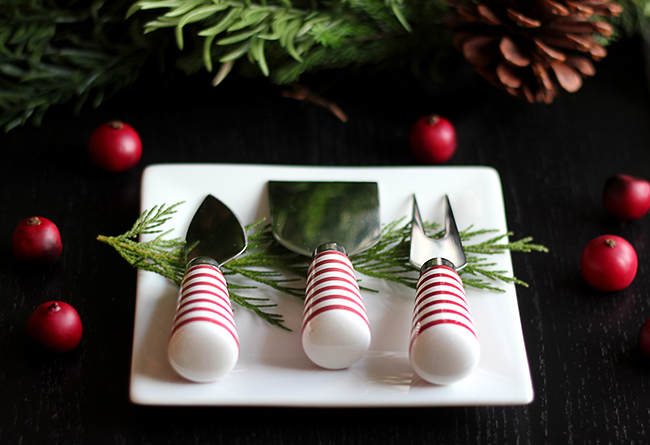 We were serving a variety of cheeses, so I also set out my favorite red and white striped Holiday Cheese Knives on a small white plate with some more greens. I was really happy with the way the table turned out, and our friends commented on how much they enjoyed the festive setting during dinner. Basically, I got to have fun creating, and people were pleased with the end result. Win win! 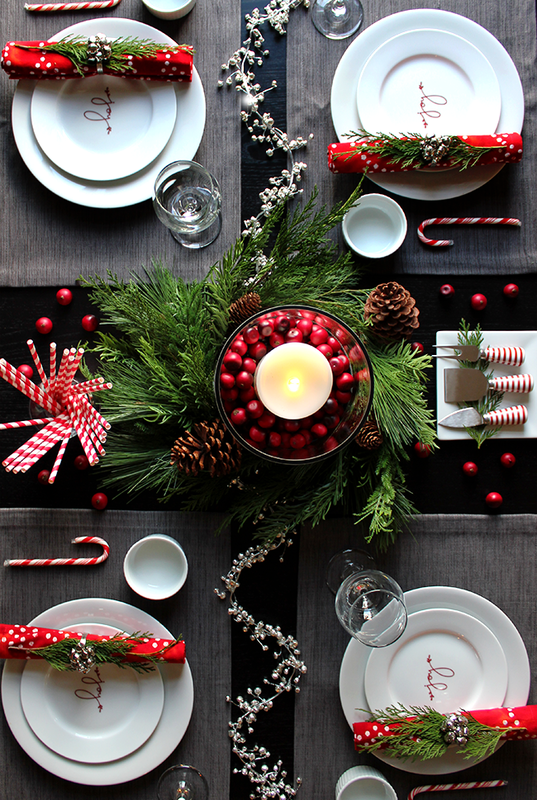 You guys already know from past posts what a fan I am of Crate and Barrel in general, but especially this time of year, I genuinely feel that they are the authority when it comes to entertaining. Their products are stylish and, most importantly, well made, and whenever I purchase something from them, I end up using it countless times over many years. I'm looking forward to recreating different versions of this tablescape several more times throughout the season when we host get-togethers. 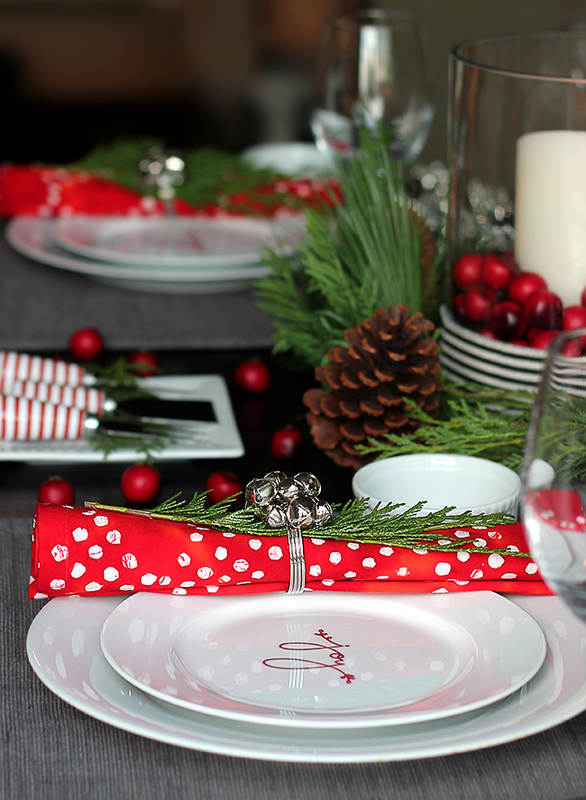 Who else enjoys designing table settings more than anything else when they're entertaining? 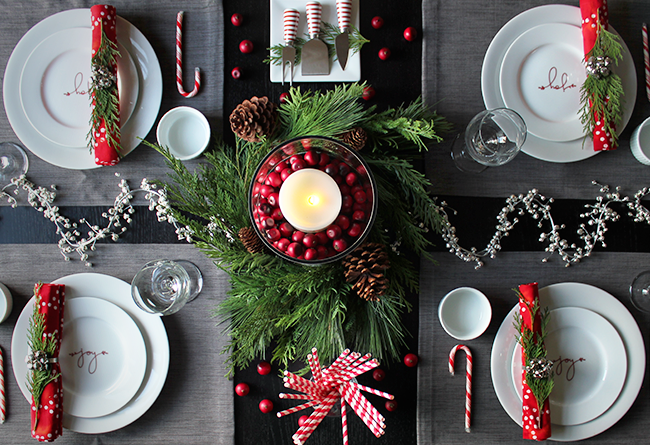 Have you put together any fun holiday table designs this year? The Black ,grey and cranberry theme is fantactic. So elegant yet warm. 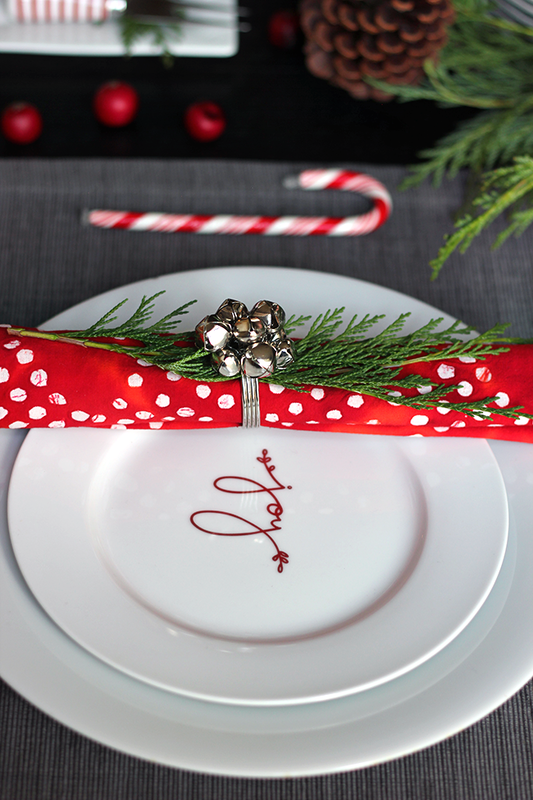 Get out of town with that jingle bell garland! Cute!! 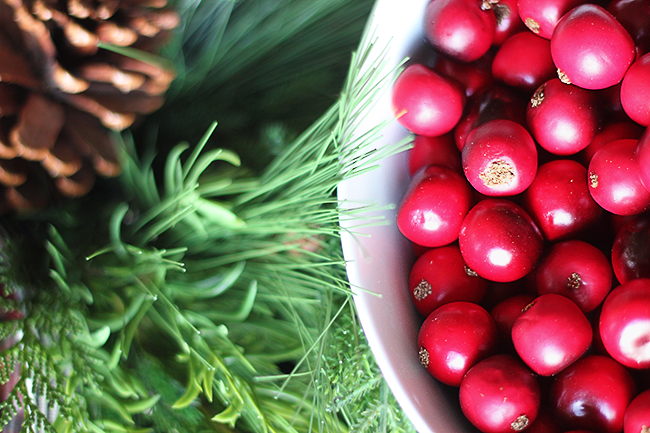 Also, I thought those were real cranberries. I need to get some of those. I was in C&B the other day but I have no problem going back. Haha. They look incredibly real in person too! 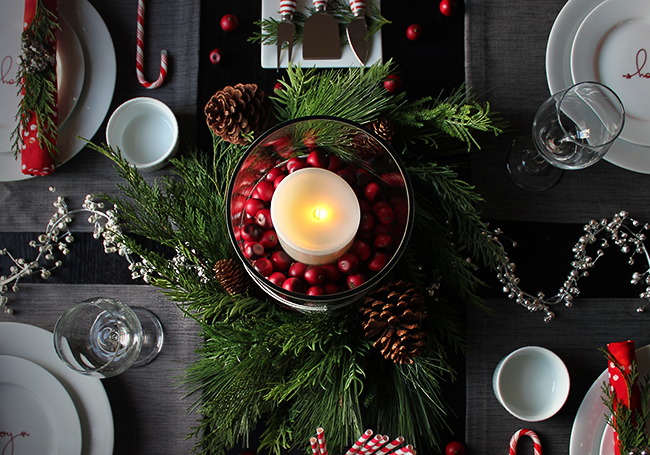 What a beautiful holiday table, Melissa! We currently have a very large kitchen island that doubles as our table - it takes up so much room that there is no space for an actual table and having a true dining space is one of the things that I miss most living with our usual home layout. One day I will lay a holiday table this lovely... but not this year. Very beautiful photos and wonderful post. Thank you for sharing your great design. This is absolutely stunning! 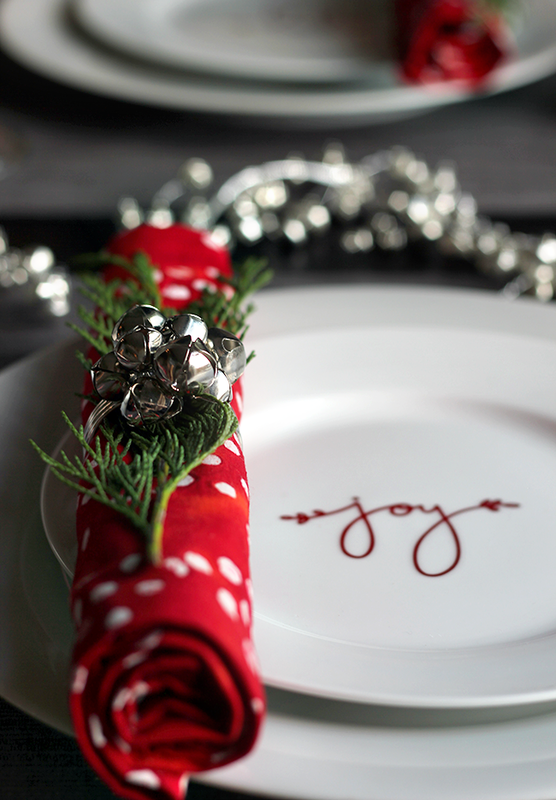 I love the cranberries and greens for the centerpiece and the joy dishes are so sweet. Thanks for your sweet comments everybody. This was one of my all-time favorite projects for the blog.